It is safe to say that most people are well aware of the possible pending misfortune when crossing paths with a black cat. When analyzing this Old Wive's Tale, one must ask one's self, why cats? And what difference does it make whether or not they are black? Felines were not alway sthe victims of bad publicity. In ancient Egypt, cats were considered sacred animals. When a family's cat passeed away, the furry feline was given a proper Egyptian burial, which included the mummification of the cat's remains. However, by the 17th century, cats were viewed as evil creatures and linked to the practice of witchcraft. During this time period, many people gathered cats along with other animals and burned tem in order to protect their homes from disasters, such as fire. Today, there are many beliefs about possible encounters with black cats, and the horrors that may follow thereafter. Some omens associated with black cats include meeting a black cat early in the morning, having a black cat turn its back on you, shooing a black cat away from one's property, and walking under a ladder after a black cat has already done so. 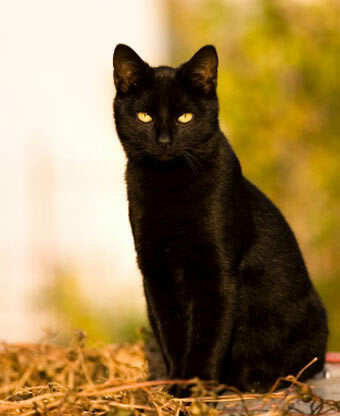 Bad luck and black cats are linked by an individuals own personal experience. For example, if an individual crosses paths with a black cat, then shortly after crashes their car, they may associate the accident with the cat and as a result, the cat bcomes an omen of bad luck. This belief is an example of an illusory correlatin. Illusory correlations occur when our normal cognitive process searces for correlations or relationships between events. So, what does this mean for the black cat superstition? It means that it is merely a superstition. An encounter with a black cat does not automatically damn a person with misfortune, neither does it grace a person with good luck. The experience following the encounter with a black cat are purely chance and in no way connected to the encounter. The relationship is based solely on one's personal experience and thought process. Lawson, Timothy J. (2007). Scientific Perspectives on Pseudoscience and the Paranormal: Readings for General Psychology. New Jersey: Prentice Hall. I've had a black cat (named Kimmy) for the past 13 years of my life. I love her dearly and I don't believe in good or bad luck. It's silly that certain animals/shapes/numbers are associated with good/bad luck. Interesting though!